Researchers from FPInnovations, Auburn University and Transport Canada conducted log truck platooning tests in Quebec last fall. What if log trucks followed the example of cyclists, who ride in platoons (known as pelotons) to reduce their fuel consumption? 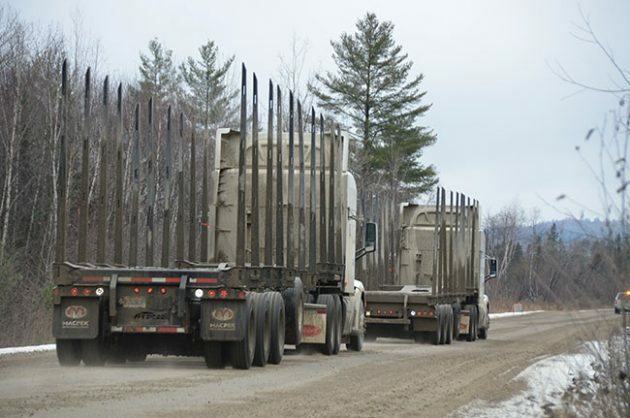 At a time when truck platooning is already a legal practice on roads in nine American states, researchers have been conducting tests on Canadian roads and even on forest roads to bring the technology to the country. These initial tests, which took place on highways and logging roads in Quebec last fall, are paving the way towards using autonomous log trucks that will help reduce fuel consumption, address driver shortages and improve business efficiency. A study by the National Renewable Energy Laboratory, affiliated with the U.S. Department of Energy, showed that trailing vehicles benefit from fuel savings of up to 9.7 per cent. But that’s not all; the lead vehicle also benefits from the platooning by consuming up to 5.3 per cent less fuel, due to the resulting vacuum effect. To reduce aerodynamic drag, trucks must follow each other very closely. To do so, and to avoid accidents, the lead truck will control the acceleration and braking of the vehicles behind using advanced technologies, Proust says. Radars, GPS, radio communication systems and other technologies are used to detect obstacles, cars, curves and changes in topography. The result is trucks following each other in convoys of two to four vehicles, at a distance of barely 20 metres, as they zip by at speeds up to 90 kilometres an hour. In the coming years, trucks will become increasingly autonomous, and the lead truck will also control the driving. Drivers in the trucks behind the lead vehicle will even eventually no longer be needed. The tests demonstrated that the technology works, but highlighted where further work is needed to improve communications between the various devices. When researchers at FPInnovations heard that Auburn University researchers, who are world leaders when it comes to connected and autonomous vehicles (CAVs), were going to conduct road tests in Michigan, they approached them and asked if they would do trials in Canada in collaboration with Transport Canada. The plan was to validate if the technology developed by Auburn University, which is designed to work on highways, could also work on forest roads, explains François Charrette, head researcher on FPInnovations’ Forestry 4.0 project. Before testing the technology on forest roads, initial platooning tests were conducted on a highway between Blainville and Trois-Rivières, Que. “There are many trials done to understand that particular technology, increase knowledge and integrate it into transport in Canada,” Dion says. However, no technology is available yet on the market. “If the technology is safe, we will put the regulations in place to be able to use it in collaboration with the provinces,” he says. One thing is for sure: truck platooning will first start on paved roads, since conditions are much more difficult in forests because of dust, sharp curves and steep slopes, Charrette says. But the industry must still clear the way for smart trucks to reduce fuel consumption and partially solve the issue of driver shortage. The tests conducted on a forest road in Rivière-aux-Rats, Que., close to La Tuque, demonstrated that the technology works, but highlighted where further work is required to improve the process and communications between the various devices, Proust says. “Trials in extreme conditions allow us to take our expertise to a new level,” says Jim Killian, director of engineering communications and marketing at Auburn University. Whether it’s for attracting workers or reducing the need for them by using more autonomous trucks, it’s in the interest of the forest industry to look into the issue, says Jonathan Perron, forest operation and wood procurement manager at Resolute. Mills have had to shut down for a few weeks due to the shortage of drivers. A number of questions remain and more trials will be required before deploying such technology on forest roads, but with the rapid development of new technologies it’s important for companies to jump on the intelligent vehicle bandwagon, Charrette says.